Jesse Joyce started his comedy career in Pittsburgh in 1998. 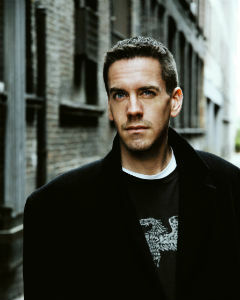 In 2001 he made the move to New York City and has earned a reputation as a rising star on the comedy scene. Jesse is known for his performances loved by crowds around the world, and for his writing style admired and respected by comedians at every level. Spawned from a family of lawyers, professional jugglers, an army ranger and a circus clown; Joyce developed his own unique brand of comic charisma. He brings this charisma to the standup comedy stage by entwining distinctively intelligent material and high energy performance. In television, Joyce has made appearances on BBC’s How Clean is Your House?, Date Night for AMC, Comedy Central’s inaugural season of Live at Gotham, Entertainment Tonight, The Tonight Show with Jay Leno’s Pass The Mic and Stand-Up 360 with Caroline Rhea. In 2010 he was a top 20 Semi-Finalist on NBC’s Last Comic Standing. Currently, Joyce can be seen regularly on History Channel’s I Love The 1880’s and RedEye with Greg Gutfield on the Fox News Network; where he brings his acerbic wit to bear on the events of the day. In October 2009, Jesse starred in Stags, a feature film produced by Ben Barenholz of Raising Arizona, Barton Fink and Requiem for a Dream. The dark comedy is about four permanent New York City bachelors, and is available on DVD and Netflix. Since 2007, Jesse had been the behind-the-scenes writing half of the long time Comedy Central Roaster: late, great Greg Giraldo. Jesse partnered with Greg to write for Comedy Central and Joel Gallen’s Tenth Planet Productions, including the Comedy Central Roast(s) of David Hasselhoff, Joan Rivers, Larry the Cable Guy, Bob Saget and Flavor Flav. His roast writing talents were also utilized for the TBS Celebrity Roast of Cheech and Chong. Success writing for Comedy Central programs led to his being requested to write on Comedy Central’s Burned! The Roasts’ Most Outrageous Moments and for The Comedy Central Roast(s) of Trump, Charlie Sheen and Roseanne. Joyce’s writing has also been utilized by Joan Rivers on TV Land’s How’d You Get So Rich? He was a staff writer for the well-received first season of The Burn with Jeff Ross on Comedy Central and has been hired to write for the 85th Academy Awards. His work in TV, Radio and Print advertising has won him several American Advertising Awards, which span as far back as 2001. Jesse can be heard on the XM and Sirius Satellite Radio where his acclaimed CD, Joyce To The World, is part of regular rotation. His reoccurring appearances on the nationally syndicated Bob and Tom Morning Show, have become listener favorites and led a featured performance on their CD: As Big As A Hat. Jesse has entertained audiences across America as well as in 15 countries and on 4 continents with live shows at clubs, colleges, and festivals. An established performer with the USO, he has performed overseas on numerous occasions. In addition to his busy club and college schedule, Joyce has appeared at the TBS Comedy Festival in Las Vegas and in 2008, was selected to participate in the Great American Comedy Festival, a festival sprung of Johnny Carson’s legacy. When not headlining clubs or performing all around New York City, he can be seen in theaters as part of The Comedy Addiction Tour where comics bring humor and poignancy to the struggles of addiction. Jesse resides in New York City with a tiny dog named Petey and about 2 dozen fish whom he hasn’t bothered to name because they likely wouldn’t come when called anyway.